UPDATE (AUGUST 21, 2018): Investors reported to have taken part in the pre-IPO funding round have rejected their involvement. Read our latest update here. Bitmain Technologies, Ltd. is about to go public. According to documents obtained by CoinDesk, the cryptocurrency mining company is filing for an initial public offering (IPO) potentially as high as $18 billion this September at a market capitalization of $40 to $50 billion. It will be underwritten by China International Capital Corporation and listed on the Hong Kong Stock Exchange in Q4 2018 or Q1 2019 amid a wave of Chinese unicorns hitting the public markets, including bitcoin mining competitors Canaan Creative and Ebang Communication. One of the most valuable cryptocurrency companies, Bitmain closed a $1 billion pre-IPO financing round led by China International Capital Corporation on July 23 at a $15 billion valuation, nearly two times cryptocurrency exchange Coinbase’s $8 billion valuation, CoinDesk reported in April. Now, a possible $18 billion IPO sticker price positions Bitmain to displace social media giant Facebook as one of the largest public offerings in history. SoftBank Group and Tencent Music are expected to top Alibaba and Spotify for the number one and two IPOs of all-time in the same fiscal period. Tencent Holdings, Ltd., Softbank Group and an unnamed sovereign wealth fund managing $15 billion in assets also participated in the pre-IPO round, according to Chinese news media and the investor documents. A minimum commitment of $5 million was deadlined by July 18 and signed over to Bitmain Technologies Holding Company, the offshore Cayman Islands investment holding group that has been linked to Chinese technology billionaire Lei Jun, founder of consumer electronics company Xiaomi, Inc.
Before this latest funding round, Sequoia Capital China had led Bitmain’s $50 million Series A and $400 million Series B rounds with the help of China’s IDG Capital, Hong Kong’s Coatue Management and Singapore’s EDBI and GIC. The Series A round accounted for 5 percent of shares at a post-money valuation of $1 billion and the Series B round valued the company at $12 billion. Both rounds were closed in the first and second halves of 2017. Projected share price and volume are not disclosed, but investment banks close to the IPO are calculating the P/E ratio to be 20 within the first publicly traded year. Financial numbers supporting this multiple indicate Bitmain profited $2.3 billion in total across 2016, 2017 and Q1 2018, with revenues of $2.5 billion in 2017 and $2 billion in Q1 2018. Bitmain is forecasting $2 billion in profit by year’s end. Half a decade ago, Jihan Wu and Micree Zhan began engineering advanced application-specific integrated circuit (ASIC) chips to mine bitcoin more efficiently. That work established Bitmain, the leading market player in the cryptocurrency mining industry. Operations have since expanded to the alternative cryptocurrencies bitcoin cash, litecoin, dash, siacoin and ethereum. With the IPO, the co-founders’ combined holdings could amount to roughly $30 billion, assuming they have retained 60 percent of the company together, per a January 2018 Bloomberg interview. Wu is 32 years old and Zhan is 39. An investor prospectus in the documents for the IPO proves exactly how significant Bitmain’s mining business has been. 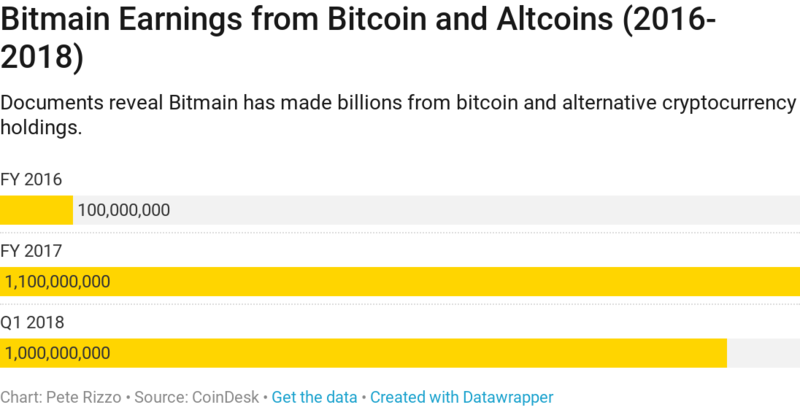 Last year, Bitmain machines accounted for 66.6 percent of the total mining volume and Bitmain-run cryptocurrency mining pools covered 40 percent of the total mining network. When the prospectus was drafted, BTC.com, the largest mining pool in the world, counted over 560,000 machines that mined approximately 11,200 out of 36,000 total bitcoin blocks. The second largest mining pool AntPool served more than 440,000 machines for bitcoin and alternative cryptocurrencies. In addition to income generated by hardware costs and pool transaction fees, Bitmain oversees its own international mining operation and has made $100 million, $1.1 billion and $1 billion off of its 2016, 2017 and 2018 Q1 cryptocurrency holdings, respectively. The numbers are being revealed to the public for the first time here. Some of the funds will back up to 30 blockchain companies for a blockchain research division, which shouldered blockchain data analytics service Blocktrail as early as 2016. Outside investments are said to represent a broader effort to turn Bitmain into a digital currency infrastructure conglomerate, and this has appeared to be increasingly true in recent months. 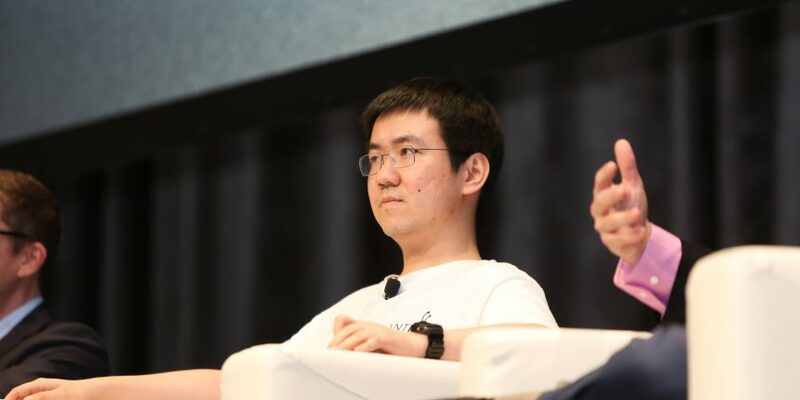 Since May, Bitmain has invested in cryptocurrency point-of-sale system BizKey, incubated decentralized exchange DEx.top, financed cryptocurrency payments system Circle, added an ethereum extension to the Opera web browser, bankrolled blockchain developer block.one and partnered with Huawei Mobile Services on a mobile cryptocurrency application. Bitmain is also using these technologies to build a wallet, exchange and trading platform that will facilitate the growth of the bitcoin cash ecosystem, a spin-off of the original bitcoin cryptocurrency that is seen as a likely breadwinner. The investor prospectus says Bitmain is “strategically developing” bitcoin cash by mining, investing and trading the coin and its peripheral technologies for the purpose of realizing substantial returns down the line. The day before yesterday, Bitmain disclosed an investment in tribeOS, a bitcoin cash advertising network. In 2013, the Bitmain graphics chip progenitor BM1380 utilized the 55-nanometer process, a mode of circuit dimensionality considered to be the most cutting-edge at the time. The company then shuffled through the 28-nanometer BM1382, BM1384 and BM1385 chips from 2014 to 2015, before advancing to the 16-nanometer BM1387 chip in 2016 to keep up with the competition. Today, the older generation of chip makers has been struggling to play catch-up. Bitmain has surpassed Spreadtrum Communications, a 17-year-old company, as the second largest integrated circuit design maker in China, according to the investor prospectus. Huawei HiSilicon, the Chinese chip industry’s frontrunner, is slipping as well. As of December 2017, Bitmain matched Huawei HiSilicon in 16 nanometer chip sales, while Taiwan Semiconductor Manufacturing Company, Ltd., the world’s largest semiconductor company to consumer goods vendors like Apple, Inc., supplied a greater quantity of 10 nanometer chips for Bitmain than the Kirin 970 chip equivalent for Huawei HiSilicon, the investor prospectus says. The unreleased 10 nanometer chip joins a new class of 7 nanometer and 12 nanometer chips Bitmain will roll out later this year. In four years, Bitmain has effectively captured 8 percent of the domestic chip design market whereas Huawei HiSilicon has taken 14 years to achieve 17 percent. At this rate, Bitmain could near or overcome Huawei HiSilicon’s local stronghold very soon and, as the investor prospectus suggests, go head-to-head with the U.S. chip industry. The Chinese market is already nudging out the American market within the worldwide chip economy, although Intel continues to lead the pack. Silicon Valley has felt the pressure. It was reported back in February that Bitmain was as profitable as 24-year-old Nvidia, which had its stock price target lowered along with AMD’s in April. Analysts pointed to a likely drop-off in Nvidia and AMD chip orders due to an upcoming Bitmain ethereum mining rig. They feared cryptocurrency miners would be less inclined to buy from Nvidia and AMD because Bitmain would outperform them at a lower cost. Ethereum had been the last major cryptocurrency to be untouched by the Chinese company’s ASICs. Still, U.S. chip makers have not been concerned. AMD, 32 years Nvidia’s senior, has assured investors that personal computers, gaming and data centers will sustain the business, with or without cryptocurrencies. But the standard applies both ways. When almost every electronic device imaginable is powered by a graphics chip, making ends meet outside of cryptocurrencies is an opportunity for Bitmain as well, and the geopolitical incentive in China is stronger than ever. The investor prospectus, with this in mind, outlines ambitions to enter into other fields of technology to “cope with the Chinese government’s ban on ICOs, cryptocurrencies and mining activities” and grow the company into a super-computing titan with an artificial intelligence arm that is predicted to generate 40 percent of revenue in the next 5 years. Also claiming testing has shown that its AI chips stack up against Google’s, Bitmain is betting neural network machine learning methods in its new line of AI products — the BM1680 processor-based tensor computing card, deep learning accelerating card and intelligent server unit — will heighten processing capacity in graphics chips for cryptocurrency and non-cryptocurrency applications alike. For now, robotics is Bitmain’s first move in pioneering artificially intelligent software and hardware. The investor prospectus says a team of “nearly 500 people” from “top academic institutions and technology companies” is working on “R&D, platform architecture, algorithm development, software and hardware development” to make good on the acquisition of smart robotics company Luobetec and the production of the Luo Xiaodou robotic pet. Bitmain declined to comment on the IPO. Correction: A previous version of this article displayed incorrect financial numbers for 2016-2018 profits and 2016-2018 cryptocurrency earnings due to translation errors in the investor documents. The charts and text have been updated to accurately reflect the accounting data.